The leaves have changed color, the air has turned crisp and cool (at least in this part of the country), and holiday decorations have already over-taken retail stores everywhere. 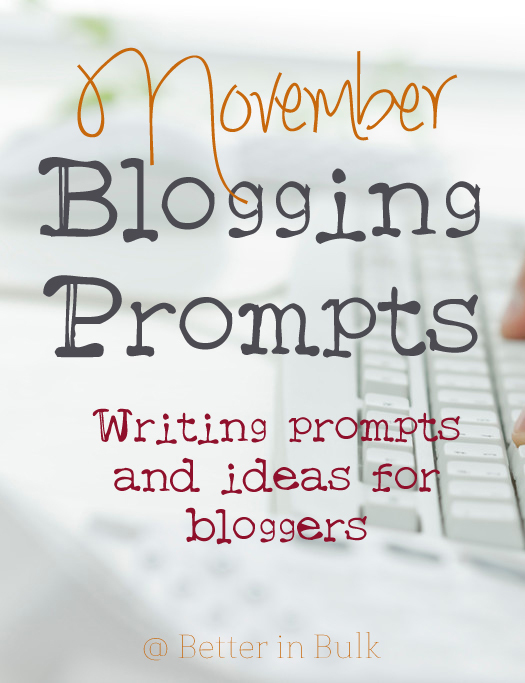 It’s November and it’s time for another round of blog prompts. Since November is Thanksgiving month, why not post a weekly list of things that you are thankful for? What are some of your favorite memories of Thanksgivings from your childhood? Share a fall-themed craft or decoration idea. What is your current favorite show on TV? Talk about what you love about it. Have you read any good books lately? Tell us about what you’re reading. Write a letter to your future self (what do you hope to be doing/have accomplished in 10/20/30 years?). Write a letter to your younger self (what advice would you give the past you?). Have you started holiday gift shopping yet? What’s on everyone’s wish lists for holiday presents? Share a traditional Thanksgiving recipe that your family loves to make. What are you thankful for this year? How has 2014 been better than 2013? Share tips on how you maintain a good schedule (school, work, extracurricular activities) during the coming holiday season. How do you stay organized? Share your best tips…or if you need lots of help, make a humor post about how unorganized you are (I promise people will be sympathetic). Spread the love – tell us about 5 of your favorite bloggers/blogs and why you love them. If you had a day off, how would you spend it? Tell about your daily routine, sharing pictures of your work space, your family space, your carpool space…if you dare! Do you have any idea that you’re excited to write about this month? Be sure to share your posts here if any of these prompts inspire you – I’d love to leave a comment! Need more prompts? Lots of my blog prompts are good for any time of the year, so be sure to check out my blogging prompts archive. Happy writing! great tips, and I will surely use your suggestions. Since I jumped into NaBloPoMo for this month in an attempt to get readers back now that I am back I will probably be visiting this list quite a few times this month..
Good luck! NaBloPoMo was what got me really hooked on blogging years ago!